Little is known outside of Russia about the nation's musical heritage prior to the nineteenth century. Western scholarship has tended to view the history of Russian music as not beginning until the end of the eighteenth century. Marina Ritzarev's work shows this interpretation to be misguided. 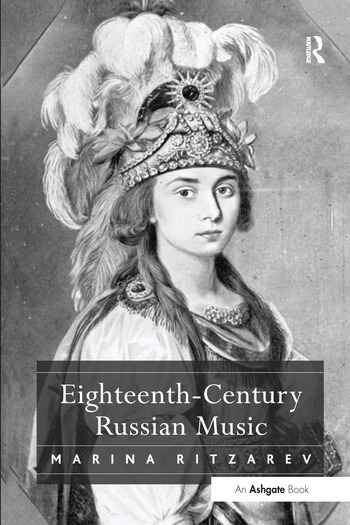 Starting from an examination of the rich legacy of Russian music up to 1700, she explores the development of music over the course of the eighteenth century, a period of especially intense Westernization and secularization. The book focuses on what is characteristic and crucial to Russian music during this period, rather than seeking to provide a comprehensive survey. The musical culture of the time is discussed against the rich background of social, political and cultural life, tying together many of the phenomena that used to be viewed separately. The book highlights the importance of previously marginalized sectors - serf culture, choral sacred culture, the contribution of foreign musicians, the significant influence of Freemasonry, the role of Ukrainian and West-European cultures and so on - as well as casting new light on the well-researched topic of Russian opera. Much new archival material is introduced, and revised biographies of the two leading eighteenth-century Russian composers, Maxim Berezovsky and Dmitry Bortniansky, are provided, as well as those of the serf composer Stepan Degtyarev and the Italian Giuseppe Sarti. The book places eighteenth-century Russian music on the European map, and will be of particular importance for the study of European musical cultures remote from such centres as Italy, Germany-Austria and France. Eighteenth-century Russian music is organically linked with its past and future and its contributory role in forming the Russian national identity and developing the Russian idiom is clarified. Contents: List of figures and tables; List of music examples; Preface; Acknowledgements; Notes on abbreviations and transliteration; Rethinking eighteenth century Russian music; PrePetrine legacy; Toward the new Russian idiom: between Germans and Italians; between Italians and Russians; At the court of Grand Duke Peter Fedorovich; The thaw of the 1760s; Lessons of the 1770s: Berezovsky and Bortniansky in Italy; The city in the 1770s; Bortniansky and the 1780s; The late eighteenth century Russian salon; Sarti in Russia; 1790s: muses and cannons; Master and serf; The choral concerto in the 1790s; Bortniansky in the nineteenth century; Bibliography; Index. Marina Ritzarev is the author of several books in Russian - on both eighteenth- and twentieth-century Russian music. She is a professor of music at Bar-Ilan University and president of Israel Musicological Society.